The 2017 California Economic Summit opened today in San Diego with a focus on creating a stronger, more equitable economy for all of California. A new initiative, Elevate California, was introduced to address crucial issues facing many Californians including poverty, income growth and the high cost of living. More than 500 civic, business and community members gathered for the Summit, co-presented by CA Fwd and the California Stewardship Network, to address problems and the opportunities facing the state. And with the 2018 elections nearing, the Summit is also a stop for the state’s gubernatorial candidates. Today, John Cox and Lt. 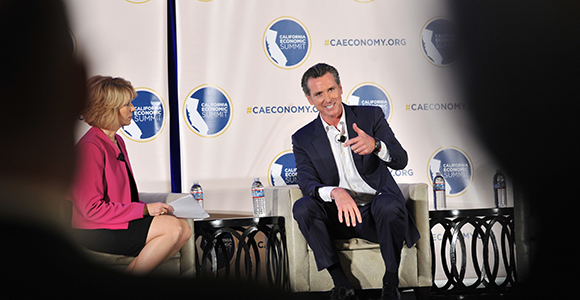 Governor Gavin Newsom answered questions about the state’s economy. Tomorrow, State Treasurer John Chiang and former Los Angeles Mayor Antonio Villaraigosa will appear on stage. The 2018 Roadmap to Shared Prosperity will expand to include Elevate California along with the One Million Challenges of increasing skilled workers, homes and acre-feet of water. Elevate California’s mission is to address the foundational issues that will lead to improving incomes, economic security, wealth generation and upward mobility. Human Development – This includes the Summit goal of producing a million skilled workers. Affordable, Equitable and Sustainable Communities – This includes the Summit goals of creating a million more homes and a million more acre-feet of water and align those with climate change and equitable job creation strategies. Quality Job Creation Strategies – The Summit will advance policies that encourage more media-wage and above jobs. The Summit is also addressing strategies for the state’s rural regions through a push to increase prosperity in rural California. Rural regions face disproportionately high poverty and unemployment rates, minimum wage jobs as well as unhealthy forests and wildlands. This working group will strive to advance sustainable economic development of these regions, including more economic opportunities, better management of natural resources and greater connectivity to the rest of the state. The Summit continues tomorrow with more discussions on strategies to create a better California.